I am disappointed that Cybex no longer supports their model #535. I have a problem with mine. When I press the down arrow & the elevation is at 1% or higher, the elevation will go all the way to the top by itself. The same holds true when pressing the STOP button. The elevation will go back down to 0% the following day when turning the treadmill back on. I have replaced two overlays, one elevation motor assembly and one elevation bracket. The belt is still in great shape even after 6500 miles of use. 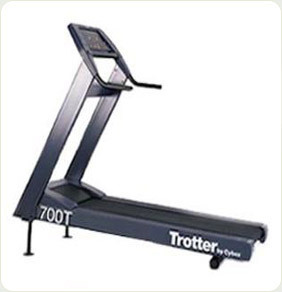 The Trotter treadmill is the finest treadmill on the market. We have one for years and it is used four or more times per week. We only recently had a slight problem and hope we will find the part required to repair it. The treadmill runs for about 2 seconds and turns off press the button again and the same thing happens. 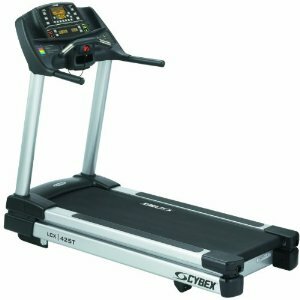 I have been disappointed and horrified by the four Cybex 425T treadmills our spa purchased three years ago (Oct. 2009). 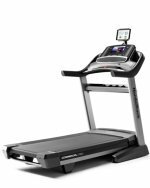 We replaced our 15 year old treadmills (Laniers), which gave us not a day's trouble, with Cybex, the best name in the industry. We have had nothing but trouble. Every other month one of the four treadmills blows a motor brush. We have replaced the motor brushes on the Cybex 425T to the tune of over $400 on each of the treadmills twice. Now ready to dump this trash for a better brand. I never will buy Cybex motorized equipment again. And the company won't compensate us. We have a small gym that is very lightly used by people who go slowly on the equipment. I have a Cybex treadmill that I got second-hand and believe it or not they do break down! Well, not completely; the incline on mine is broken (and has been since I got it). I've had my father-in-law try to fix it and he can't figure it out (and he works on all sorts of different machines for a living). Other than that it works great! It's big, bulky and doesn't have all the bells and whistles but I get a pretty good workout just the way it is! I've had it and used it for almost 2 years just the way it is and haven't had any problems so far!